Yep, it's that time again. I've got a mob or unruly kids in detention and I want to look busy by typing away on the computer. Time to 'examine' another of the races of the Warhammer world and wonder where the bloody heck they came from in the first place. 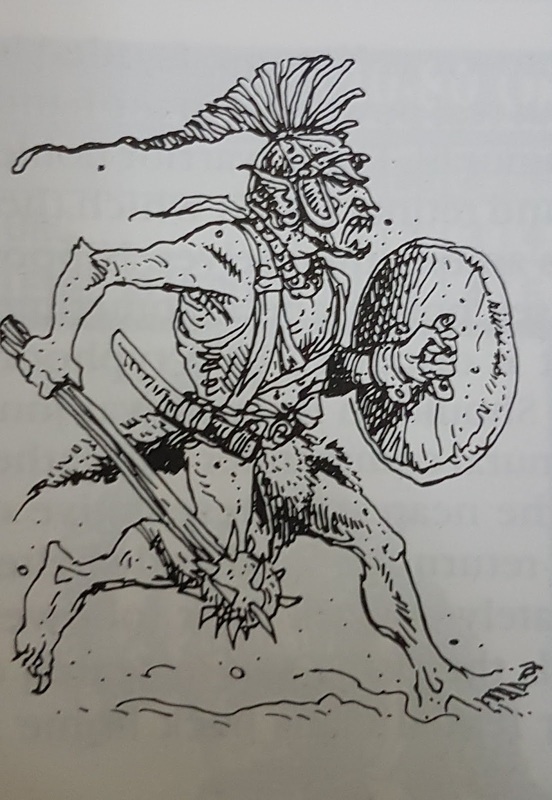 Lanky, Hairy, slightly more intelligent cousin to the orc have always been unfairly treated in Warhammer. First off they were only ever a sideshow to their bigger (and littler) cousins and only ever got a mercenary list in Warhammer rather than a nice, big, full army list like other folks. They were tucked away in the east, a place of vagueness and unkind racial stereotypes and a place that Warhammer rarely spent any time visiting. Then all of a sudden they grew big old goblinoid noses and became slaves to the Big-Hatted chaos dwarves without so much as a by your leave from any one! 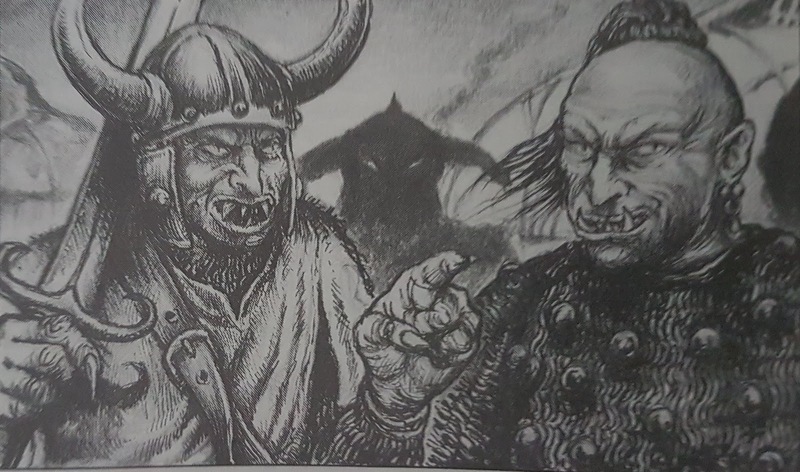 So where does these oddballs of the Goblinoid race come from and how come they went from having a mighty empire which scared the crap out of far Cathay to being the whipping boys of the snaggle-toothed stunties? HobGoblins originated in folklore as the country bumpkin version of a Goblin, Hob being a separate name from Goblin. Shakespeare's Puck was a Hobgoblin. They were essentially little house-hold spirits that played practical jokes and could be a bit a nuisance. Someone eat the last bit of cheese? That'll be a Hobgoblin then. Can't find your shoes in the morning? A Hobgoblin must have hid them. Candle keep getting blown out? Must be that bloody Hobgoblin again! So far so English pastoral. As bloody usual we have to go looking at Tolkien to see how the meaning of Hobgoblin changed. As we all know, old JRR was keen as mustard for nicking old anglo-saxon words for creatures in his worlds. Orcs and Goblins are essentially interchangeable within his lore and are explained as two words for the same thing. He does mention in the introduction to the Hobbit, however, that Hobgoblin is a name given to the larger sort of Goblin/Orc. So here at least we have the start of the Goblinisation (to borrow a term from Shadowrun) of the Hobgoblin. Leap forward to the dawn of the Fantasy Age and Hobgoblins make an auspicious appearance in D&D and in AD&D and are described in 1977's Monster Manual as a Lawful evil race found pretty much everywhere that are known to bully Orc's and Goblins as well as build villages and forts. The idea that they are big enough to bully Orc's come straight from Tolkien but we can see them now as separate from their cousins rather than just a bigger version. It's this leaping off point that GW take with Hobgoblins, and, to be fair, most races. 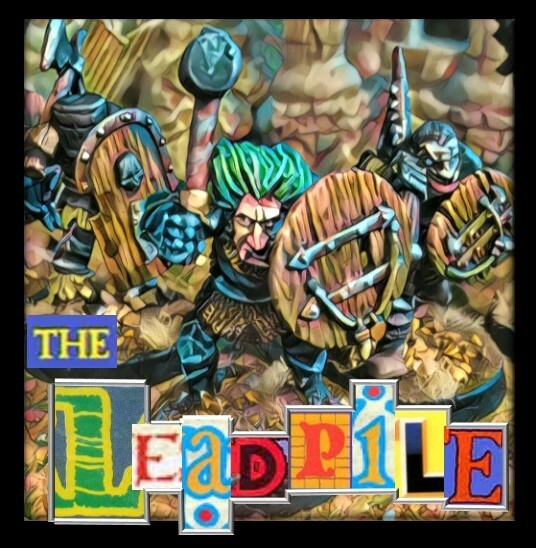 As we've discussed before, the citadel range started as miniatures for RPG games such as D&D (which GW distributed in the UK) so it makes simple business sense to include your products in your own games. 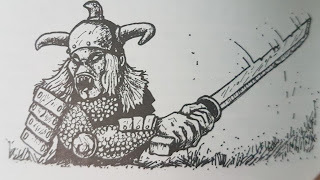 The first couple of citadel Hobgoblin ranges didn't show any huge cultural signifiers, one range looked like scrawny goblins with horny helmets (C36) and then there was a Nick Lund range (N12) who were much more powerfully proportioned but not hugely different to his Orcs. With Ali Morrisons Hobgoblins though, things started to take a slightly different direction. The figure physiognomy changed to give them a slightly eastern look. This has been pointed out as possibly racist in today's atmosphere and caution has to be taken when discussing this aspect. A quick look at anti-japanese propoganda from WW2 will give you an idea of why some may question the wiseness of this particular design choice but it must be tempered with the realisation that Ali was also sculpting the Oriental Heroes range at the same time (C05) which shows a far more respectful view of Eastern Culture. Whatever the rights and wrongs of this choice the range begins to bring in signifiers of an asian origin of the Hobgoblins. To be more precise, the figures start carry signifiers of a steppe-nomad origin or at least a simplified version of such. 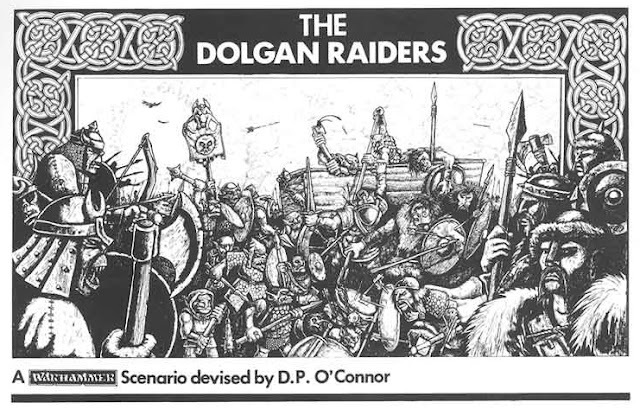 The Dolgan Raiders scenario from the Autumn 85 Journal has Hobgoblins as the main villains and is set in boundless steppe of what, in our world, would be Russia. So what you essentially have is a horde of nomadic goblinoids ruled over by a single all powerful Khan or king. These tribes range from the borders of Kislev all the way to the walls of Cathay. This brings images of famous Warlords to mind, Genghis Khan, Atilla the Hun, Tamerlane and transfers the image of these dangerous, fearsome, all -conquering, nomadic, Turko-Mongol peoples into a fantasy race dominating a large part of the world. The various steppe Empires were ruled by a variety of dynasties, the most successful of which were able to unite huge amounts of tribe and conquer massive areas. The Mongol Empire was the largest contiguous land empire in the world at one point. All this gives you an idea of how powerful the Hobgoblins actually were and why they were such a huge threat to Cathay (and therefore could have been to Kislev and the Empire should they have chosen to migrate in full strength in that direction). 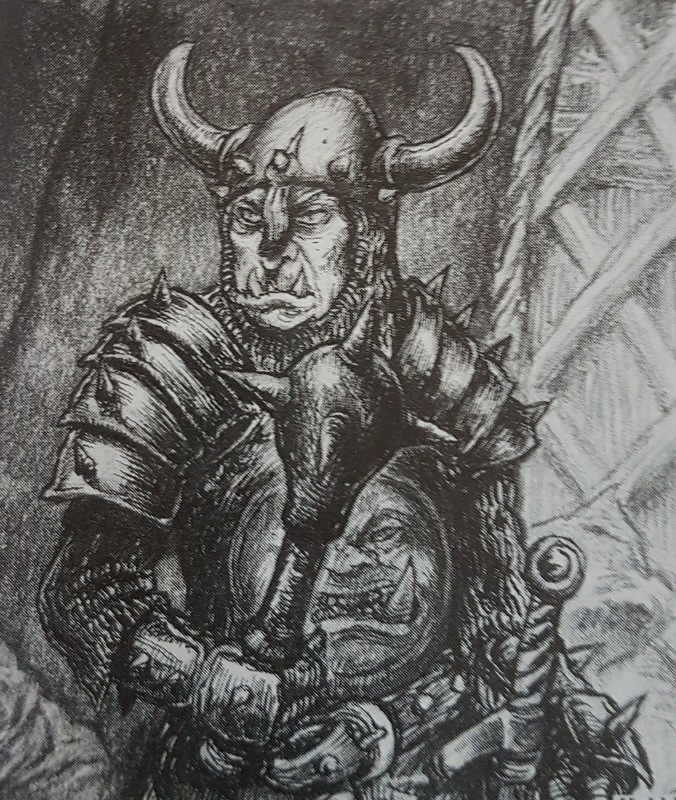 So what could have happened to have reduced the most powerful Goblinoid empire in the world (no Ork Warlord ever came close to the scale of the Hobgobla Khan's Empire) to miserable servitude under such a numerically small race as the Chaos Dwarves (If they need to have Slave warriors in their armies then their own population must be relatively small)? If we have a look at history for clues then we can surmise a possible scenario for the fall of the Hobgoblin Empire. Firstly we need to understand that the strength of the Hobgoblins is in their unity. Their realm is bordered on all sides by aggressive adversaries. Cathay to the South-East is strong and magically able with a strong wall to keep the Hobgoblins at bay. To the North is the Chaos Wastes and the nomadic warbands and tribes who follow the dark gods. To the south west, over the Mountains of Mourn which are home to the Ogre Kingdoms, are the Darklands dominated by the Chaos Dwarves. Further west are the Lands of Man. At some point in Empire there will come a point when power has to be passed from one leader to another. Even if the line of succession is simply from father to son, it can still be a dangerous time if the Father dies unexpectedly and the son is too young to exercise power. Sometimes there will be no sons and the failing health of the Khan and his inability to produce sons will be deemed as a weakness. Whatever the reason, on the death of the Khan, powerful usurpers will move to take power. If the moment has been a long time in the coming then there will no doubt be many who will wish to become the next Khan. This will often lead to civil war as the Empire splits along tribal lines. Individual Warlords proclaim themselves to be the rightful Khan and the Empire is split into smaller and smaller Khanates. The infighting will be devastating enough to the Hobgoblins but often the way with internecine struggles, one faction will attempt to enlist outside help in order to defeat it's rivals and in doing so will invite an wolf in their home. One Khan may have turned to the Gods of Chaos, one may have tried to ally himself with the Ogre's. Another may have agreed to accept suzerainty of the emperor of Cathay and yet another may have approached the Chaos Dwarves for help. In addition to the great powers all kinds of powerful wizards, warriors, mercenaries and warlords may have been sucked into the mayhem of the fall of the Hobgoblin empire. Whatever the alliances made and the deals struck, in the end the Hobgoblins were diminshed. Tribes defeated tribes, Allies took advantage of bad deals, Chaos took it's chunk of flesh and Ogre's would have gotten hungry and in the end the Hobgoblin empire was no more. We can only surmise that the deal that was struck with the Chaos Dwarves resulted in those tribes foolish enough to make it being held in servitude for eternity. The scattered remnants of the great Hobgoblin Horde still wander the great steppe, wary of outsiders and only a shadow of their former selves. But why do we not know more of this great and tumultuous event? The Hobgoblins didn't keep any written records, they had no need for such frivolities. The ogre's quickly forgot and the Chaos Dwarves have no interest in sharing their knowledge. If only they still existed. Nice thought exercise. My main beef with the Hobgoblins is the lack of figures available. I've looked in many places and none of them have been satisfactory to me to make even a small mercenary force. I quite like the Otherworld ones myself. I thoroughly enjoyed this history, best detention I ever went to. What a fantastic read! The best I could do whilst on isolation duty in my school was to analyse various OD&D dungeon layouts - Friday p.6 is my saviour. 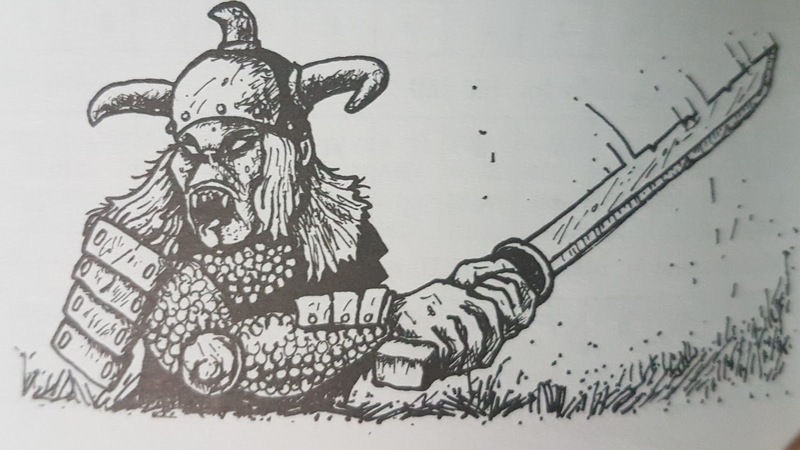 Whilst looking for a decent Hobgoblin range for D&D, I settled upon Oathmark Miniatures Goblins for my Hobgoblins. I use LotR Goblins as Goblins. I’m praying that Oathmark will produce a suitably brutal set of Orcs one day. 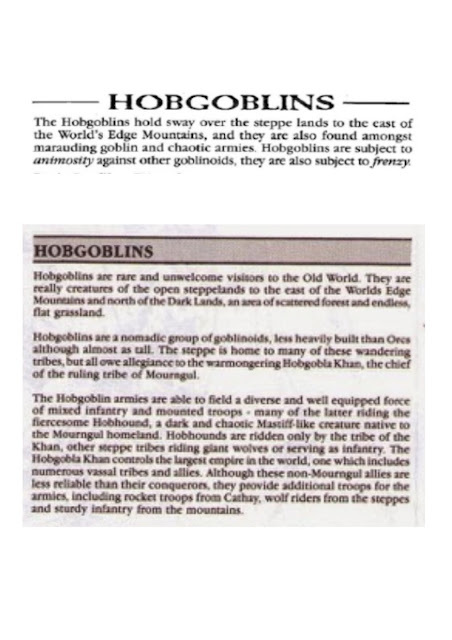 I enjoyed reading this as I do anything about Hobgoblins. Though I'm not so sure about the loss of the Hobgoblin Empire, it may have lived on a while longer. At least in my Warhammer world its still alive and well. 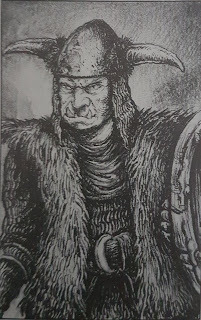 Ghazak Khan and Oglah Khan's wolfboyz are from the Hobgoblin empire and their fluff is post Chaos Dwarves Hobgoblins so the two Hobgoblin types seem to co-exist or at least did for a while. That said, references to the Hobgoblin empire seemed to have disappeared by 7th ed, and a map in Warriors of Chaos book from that time notes the battle "Oglai Khan's Last Charge" which one could infer led to the destruction of the Hobgoblin empire. 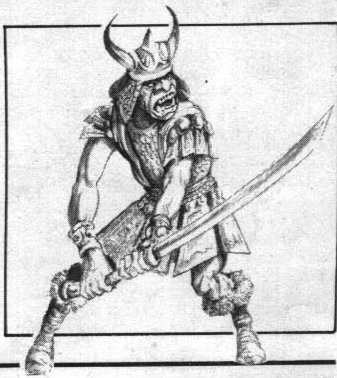 I'm glad you raised Aly Morrison's samurai range, as his hobgoblin boxed set was explicitly advertised as opposition for the samurai. 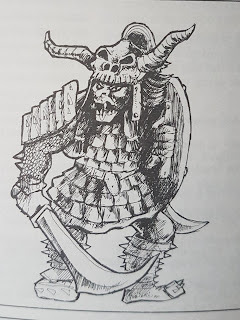 I think that context rather undermines the "racism" argument, as the hobgoblins look very similar to Japanese oni (as a kid, I used to bolster my hobgoblin regiments with Dixon's oni and bakemono goblins). 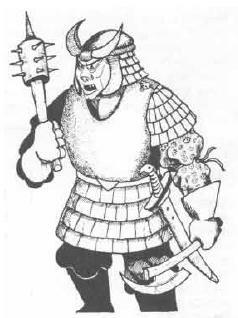 Essentially, Citadel produced a range of Asian humans and a range of Asian monsters as adversaries for them. There's also the point that the Morrison hobgoblins just look *incredibly cool* - they're fearsome and stylish, not comic or clownish like the racist propaganda. 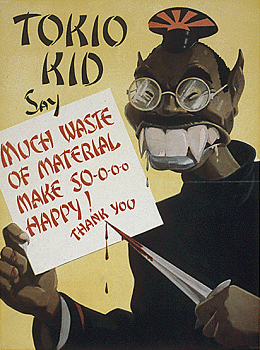 The racist stereotypes in the US propaganda are *goofy* - but the Citadel hobgoblins are the least goofy of all the Citadel goblinoids. 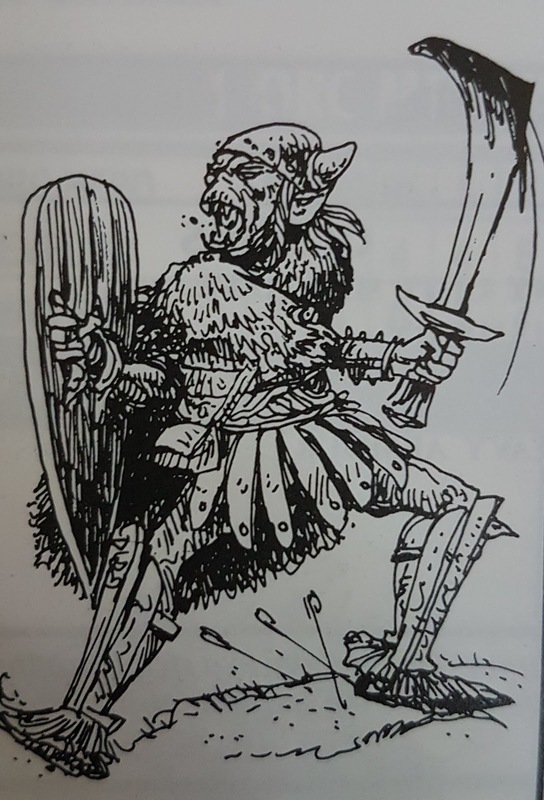 I wouldn't describe the Perry hobgoblins as "scrawny"; they're just as beefy as the C15/16 orcs of the period, and fit in well with them. I've got a few of them here - I reckon they're a fairly fearsome bunch. They have the same three-toed feet as the later Morrison ones and the Fiend Factory goblins. One pedantic etymological point: while Tolkien certainly promulgated the idea of a hobgoblin as an especially fearsome goblin, the shift away from the original meaning of a domestic or familiar goblin to a particularly nasty one had already happened. If I recall correctly, this happened in the seventeenth century, hence John Bunyan's "hobgoblin nor foul fiend", which is a much nastier proposition from Shakespeare's "Some hobgoblin call me or sweet Puck/I do their work and they shall have good luck". Certainly, by the early eighteenth century, "hobgoblin" has come to mean a source of fear or dread. The shift may have something to do with the Jacobean obsession with black magic, and, subsequently, harsh Puritan views towards folk beliefs. Tolkien went with the nastier meaning for hobgoblin, but dropped it when he discovered that the original sense was a smaller, less fearsome creature, which is why the term only appears in The Hobbit. I recognise most of the illustrations above from Ravening Hordes and the like, but not the more detailed head-and-torso ones that match the Morrison C36 range. Are those from a WHFRP book? Anyway, I really enjoyed reading this breakdown - and must get on with painting up my Morrison C36s! 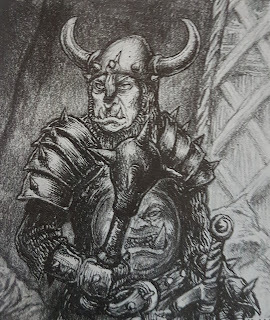 The head and torso illustrations are from 'Something Rotten in Kislev' where a Hobgoblin war band has to be negotiated with when the adventurers are taken into their camp. There is a fair amount of background about Hobgoblins and their way of life. Well worth a punt. Thanks! I'll have a poke around and see if I can find a copy. 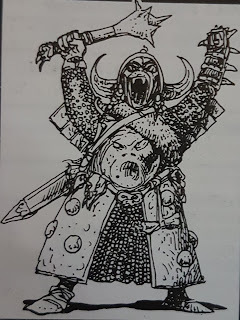 I used to love hobgoblins in WFB 2nd edition, because the frenzy rule made them so formidable. They were a match for orcs in close combat normally, but once they went into frenzy, they doubled their attacks. Third edition tied the frenzy into being Mournguls and having their army standard on the table. 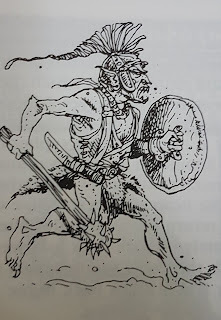 I always thought that hobgoblins fitted into the Old World of WHFRP much better than GW's orcs and goblins, which are a bit too comic to work with the darker material in the role-playing game. The hobgoblins, lacking the goofiness (and the greenness, at least in their earlier incarnations), were a much better fit. WP WOW what a great article! Well done, well done! 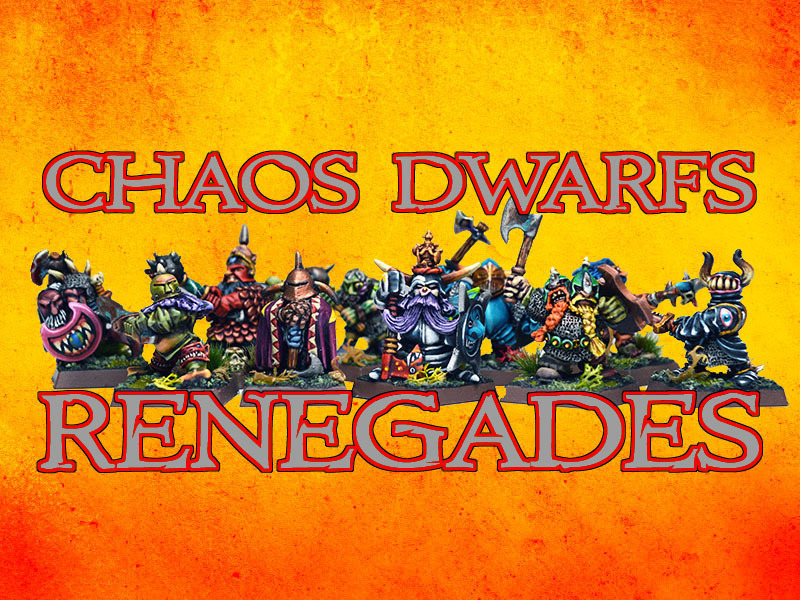 I have always been frustrated with them being featured in WHFB3 and the utter lack of figures. And then what is available isn’t all that desirable. Ally’s limited range was okay but small. The Big Hats figures were mediocre at best and the dogs of war figures were embarrassing. I’ve always thought that Jes Goodwin’s Uruk-Hai make the best hobgoblins figures it’s a shame that they were such a limited release and so damn expensive! I’ve got just about enough for a small unit. 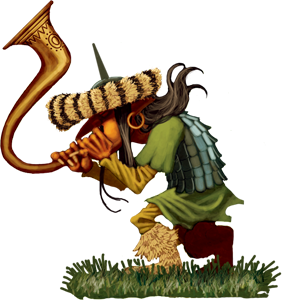 This is a nice repository of hobgoblin info. 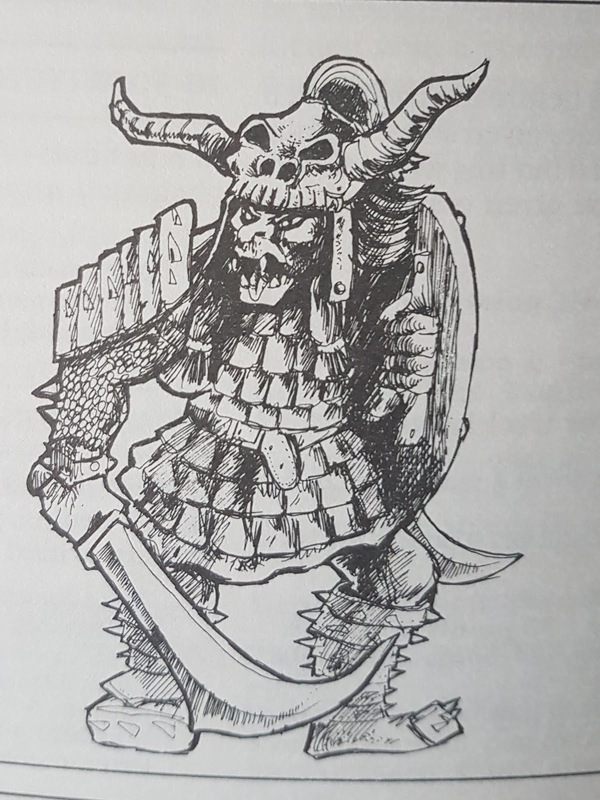 Since I'm working on a combined force of oriental themed greenskins right now I think I will base it on the times after the fall of the hobgoblin empire and the power vacuum that exists on the steppes. It all fits very nicely :D Hat off to you Whiskeysir! Interesting and informative article. Always liked the Hobgoblins just because of their Turkish/Mongol feel.